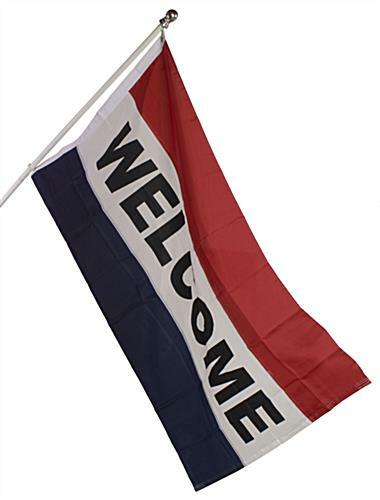 This Sign Supply is a Welcome Flag that Lets Everyone Know You're Open! Wholesale Sign Supplies Online! Sign Making Company Sells to Business and Industry! 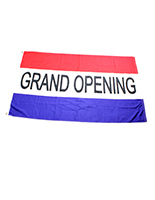 The sign supply, welcome flag, has quadruple stitched ends to reinforce the nylon, making this flag suitable for outside use. 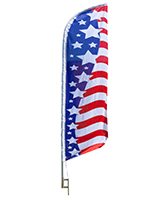 This communication banner is an ideal sign supply to easily suspend in various ways with two (2) grommets. The sign supply, also recognized as a communication banner and a publicizing sign, is noticeably read by bystanders on the street with its big just about 5'x 3' dimension. Communication signage, sign supplies invite clients into your business by utilizing a friendly tagline that greets them as warmly as your workers will. 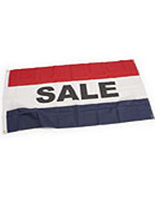 Use quality sign supplies for sale online to greet your customers! 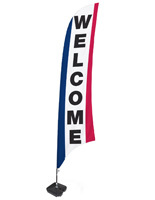 A sign supply, like a publicizing banner and a communication flag, greets possible clients as they pass your shop front, welcoming them into your marketplace. 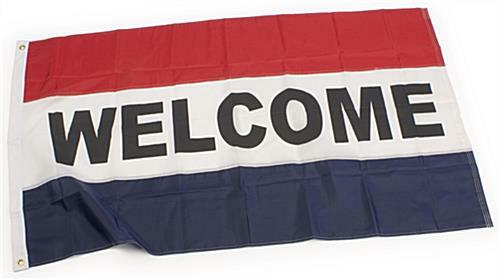 This sign supply says the word "welcome", composed in black on a white background between circular rings of red and blue. 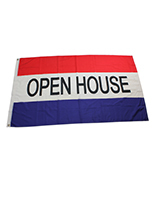 Vibrant colorings make this flag effortlessly recognizable to all onlookers, informing them that your setting is open and able to do sales. The publicizing banner, sign supply is double-hemmed, offering you with a long-lasting sign that will survive for years to come. Buy wholesale sign supplies now!